Your skill and talent for facilitating workshops was impressive. The day went without a hitch and the time flew! We were all totally engaged and enriched. I know my life won’t be the same. I have a deeper respect and connection with our loving Mother Earth and the blessed beings that inhabit her. I loved the power generated when 12 loving, dynamic women joined in connecting with each other and the animals to open a gateway of communion and support. This day opened my heart to the knowing that we are all one and through loving oursevles, each other, all living things and our loving earth mother, we connect and support each other as we are designed to do. 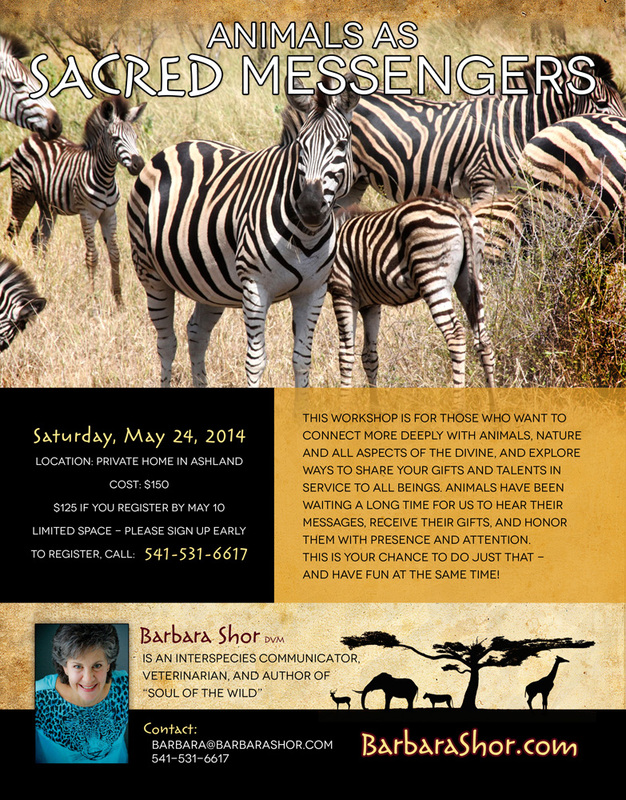 I cannot bespeak all the magic unfolding during and after Barbara’s workshop, Exploring Our Wild Souls. The grace with which the doors opened to several new animal totems coming through during the workshop is still awe inspiring â€¦ whale with me all day and sending out love vibes â€¦ lioness letting me know she’s “got my back” â€¦ and ancient elephant voices coming through to remind us It’s All About Love, And Only About Love. Just a few fleeting glimpses of this transformative experience. My new totems carry on their work with me to this day. I really love your authenticity and how you kept the workshop light. Your ability to listen rather than sticking to an agenda is a true blessing. What I liked about the day was the opportunity to spend time with like minds. I believe it is the first time I have walked away feeling connected, connected to a purpose. I may not have direction yet but I know how to listen. And I have you to thank for that.